In 2014, Atletico Madrid caught the imagination of the world when they scripted one of the greatest underdog stories in football. Despite their vastly inferior resources, the Rojiblancos lifted the La Liga title ahead of the European giants Barcelona and Real Madrid. Two years later, following the same path of Atleti, a small club from East Midlands made the whole world sit up and take notice by lifting the Premier League title. Although the two places are separated by 1373 kms, the football played by both clubs have paved out the perfect formula for the less-fancied teams to upset the footballing giants. Unlike many one-season wonder clubs, Atletico Madrid have shown consistency across the league and the Champions league. They secured four top 4 finishes in a row in the league, and made it two Champions League finals in the last three years. So much so that, Diego Simeone and Atletico Madrid have become household names in the footballing world. With Leicester City also set to ply their trade among the European elites next season, the 'Atletico Madrid way' will be the ideal path to follow. So let’s look at how the Foxes from England can follow Diego Simeone’s Rojiblancos. The traditional 4-4-2 was on the verge of extinction a few years back with teams opting for different variations of 4-2-3-1 and 4-3-2-1 for defensive solidity and possession. 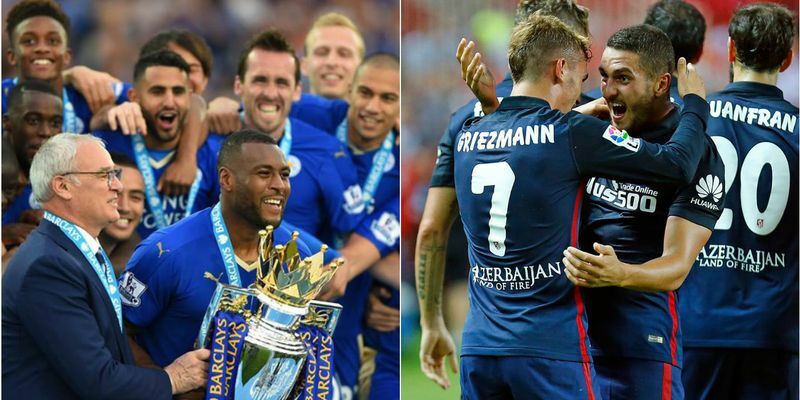 Atletico Madrid brought it back into fashion before Leicester City took it up and ran with it. In Atletico’s system, the wide players are an essential component in both attacking and defending. Saul Niguez and Koke are not traditional wingers and often make the midfield a flat four by tucking inside. This gives Junafran and Luis the option to bomb forward and whip in crosses for the forwards to feed on. The pace of Griezmann and Torres also give them option to break quickly even after sitting back. Leicester also employ a similar strategy, but Mahrez and Albrighton play in a wider role than Niguez and Koke during attacks. At the same time, the wingers tuck into the midfield when defending. The defensive cover provided by Kante and Drinkwater also allows Mahrez and Albrighton more freedom than what Atletico play with. Atletico’s style of sitting back, conceding possession and scoring on counter-attacks have proved to be fruitful in Europe as their third Champions League final appearance in two years would prove. Leicester employed a similar strategy in their title winning run and will have to do it more clinically in their European campaign. In terms of goal scoring, Leicester and Atletico have identical numbers in their respective leagues. With both teams playing a similar style of football, the matching numbers in goals scored is expected. But, remarkably, even the goal scoring situations are alike for both the teams. Although they are way behind high-scoring teams like Barcelona and Real Madrid, who have scored more than 100 goals in the la Liga, Leicester and Atletico bank on winning games 1-0, having won 7 and 10 games in their leagues, respectively, with that scoreline. "What I want, my desire, is to have 100% possession,” Bayern Munich manager Pep Guardiola said after defeating Arsenal 5-1 in a Champions league game last year, a game in which his team had 66% of the possession. When managers like Guardiola and Louis Van Gaal focus on dominating the possession, Atletico Madrid, and Leicester City play in a way that is completely in contradiction with the possession game. The teams are actually more in tune with the 'Jose Mourinho way' of football, which concedes possession and favours counter-attack. "For me, I am very simple in my analysis. Football is about putting the ball in the net of your opponent and stopping your opponent," Mourinho once said, and that is exactly what Leicester and Atletico does. In the second leg of this year’s Champions League semi-final game between Atletico and Bayern Munich, Pep Guardiola’s side had 72% of the possession and 33 shots, still they ended up on the losing side after Atletico went through to the finals on the away goals rule. Similarly, in Leicester’s match against Manchester United, the Foxes had just 29% of the possession but still returned from Old Trafford with a point proving Mourinho’s point right. In fact, champions Leicester are the third-worst team in the Premier League in terms of possession, with only Sunderland and West Bromwich Albion behind them. 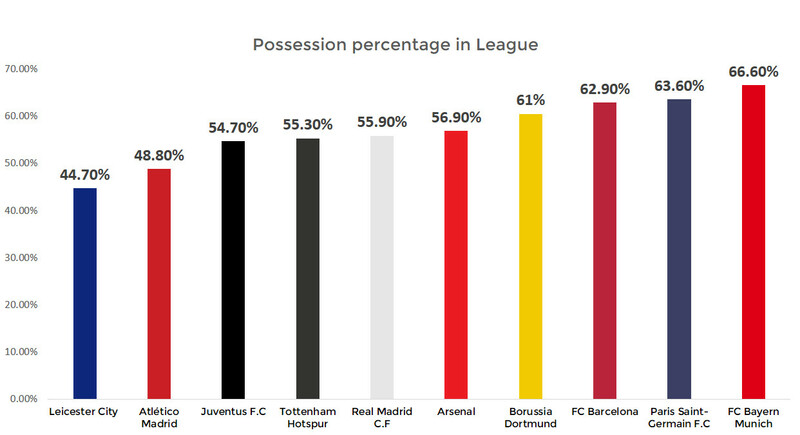 On the other hand, Atletico Madrid are third in the La Liga in points, but find themselves in the mid-table in terms of possession. With goal scoring not being their forte, solidity at the back becomes an important element of Atletico’s success both domestically and in Europe. Diego Simeone’s side have the second-best defensive record across Europe’s top-five leagues, conceding just 18 goals in their 37 games. 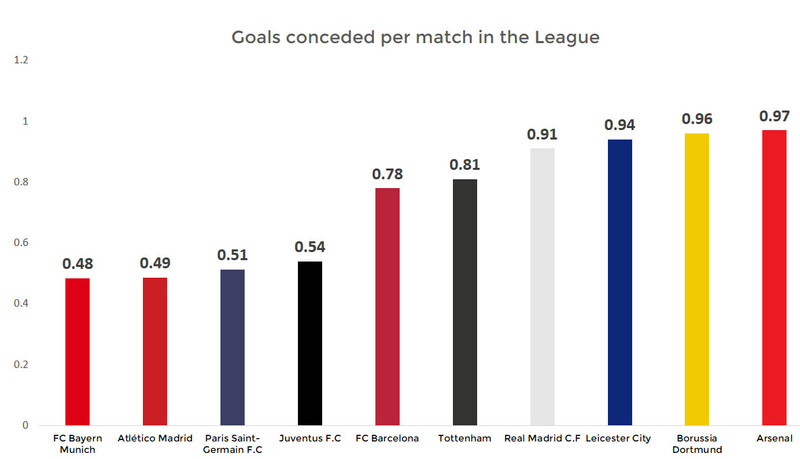 Although Leicester City have conceded almost double the number of goals in the Premier League, their numbers are impressive in terms of English standards--they have the third defensive record in the league. The Rojiblancos have perfected the art of putting bodies at the back and stifling opposition from scoring, while Leicester are yet to reach the standards of this well-oiled Atleti side. Atleti usually defend narrowly and they push their rivals wide for space, while Leicester's back four are usually wide apart. Another part of Atletico’s impressive defensive record is the number of tackles they make per game. They have made the most number of tackles in the league, and have conceded the least number of goals in La Liga. Unlike Barcelona, who dominate the possession and conceded few shots, the Rojiblancos willingly give way the ball and despite that they concede very few shots. Defensive stability and organisation are most important aspects of Diego Simeone’s side in a world which worships goal scorers. We can see shades of Atletico’s defensive play in Ranieri’s Leicester as well. The Foxes made the second-most number of tackles in the Premier League, just behind Jurgen Klopp’s Liverpool side. However, when it comes to shots the difference between Ranieri’s work in progress and Simeone’s masterpiece becomes clear. Leicester are in mid-table when it comes to conceding shots, a long way away from Manchester City, who just concede nine shots per game. Having perfected the art of tackling, Atletico’s failed tackles per game are lesser than that of Leicester, who were just adopting that style this season. After failing in their prediction of picking Leicester City to be relegation candidates, the critics have now started to predict a miserable campaign for the Foxes when they will take on the European elites next season. Although they will find it tough to juggle between their European and Premier League commitments, Atletico’s successful run in the Champions League and the La Liga have shown us that the underdogs can match up to the big guns in Europe. The numbers just threw more light on how the Foxes can continue their underdog story in the Champions League next season. With a bit more squad depth and more defensive solidity, Leicester can become the next Atletico Madrid in Europe.